Today I went to the Sports Turf Managers Association seminar at the Nike World Headquarters located near me. We were warned in advance not to wear any non-swooshy brands. I was much gratified to see the featured speaker was sponsored by UnderArmor. It is also a nonsmoking campus. This really made me want to smoke but I am a nonsmoker so I had no cigars. I was absolutely amazed at the size and scale of the place. It is completely shocking to see such a gratuitous display of conspicuous consumption in a day when the buzzword is sustainability. 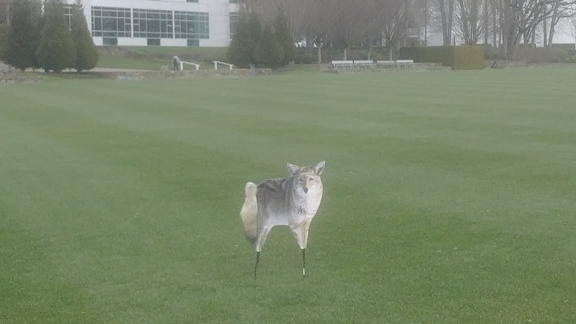 Nike uses fake wolves to scare Canada Geese off their pristine playing surfaces. They also use lasers which unfortunately do not disintegrate the geese or even teleport them back to the land of Ralph Goff. The lasers just annoy them. I needed to come up with my favorite athlete. This was especially important since I am a Sports Turf Professional. I said Pele' is the greatest athlete of all time! I said this with much conviction. This got me into a heathy discussion about the state of Argentine and Brazilian soccer of which I had no clue. I was going to say something about Manchester United but thought I should keep quiet. My knowledge of soccer comes from listening to British Ska from the 1980's, Benny Hill, and "Are you being Served?" Speaking of getting into bad situations there was also the time I went to a bar and my knowledge of drinking came from old Country-Western songs and Raymond Chandler novels and for some odd and misdirected reasoning I ordered a Gimlet. That nearly got me a boyfriend. Today I learned that I was correct in my assessment of the under fertilizing and overwatering tendencies of my department. I was also correct in using an electronic moisture tester, I read it correctly, and yes there are amazing new varieties of grass seed which are drought tolerant and grow really fast and types of fescue that are fine stemmed like perennial ryegrass but are hardy and.. and.. oh well... Also, while I was criticized in my recent employee evaluation for this very thing, I struck up conversations which provided important resources for the grounds department of my college. For a few hours I thought about how much I loved my job. But then I remembered I work for a bureaucracy and as soon as I start to love my job I will be cut down to size for some stupid minutiae for the sake of putting me back in my place. So tomorrow it is back to work and I can only image how the important and useful information will be reimagined into a useless and misguided project that will bring annoyance and frustration to myself until I realize that it all pays the same and I'll go back to finding satisfaction in making the perfectly straight lawnmower trail, when I achieve that I shall retire. Speaking of straight lawnmower trails I was able to make a trail of hydraulic oil nearly all the way around the baseball field when the main drive for the reels ruptured under the center of the mower. I can't see directly behind me so I didn't find it till the second round. Surprisingly, the baseball coach sent an email defending me and praising my efforts at cleanup and thanking me for my sincere apology, to my supervisor. Not the email I expected I can tell you that. I did get right on the mess with peat moss to soak up the oil, and a good dose of dawn dishwasher detergent. If it works on oily ducks why wouldn't it work on a baseball field? And there you have it... The life of the lazy groundskeeper. Not so much different than the life of the lazy farmer. Except the retirement is better (I hope). Groundskeeper Bud, I aspire to be a lazy farmer too when I get around to it. First I have a yard full of snow to clean up. Or maybe wait for the sun to melt it. And when are you going to send our geese back North? Except it probably has health benefits. A Nike seminar! You have at last hit the big time! BTW, you could also try the wolf/coyote cut outs in the field to scare geese, but they would probably get shot up by the local AR15 types. I will recommend "The Worst Hard Time" which documents the plowing of the OK and TX panhandle, CO & NB, the WWI run up of wheat prices, and then the subsequent crash of wheat prices which resulted in more turning of prairie grass which all caused the the 1930s dust bowl...coupled with drought. Having said that Dawn works really well for cleanup of a hundred gallons of #2 fuel oil that you don't discover for a few months. Mowing straight causes me to hit things.